﻿Chamomile tea ﻿is best known for it’s calming properties. Many people use it as a mild sedative to relieve insomnia, reduce anxiety and encourage a good night's sleep. It has been also been credited with boosting the immune system and aiding in digestion as well as relieving menstrual cramps and upset stomachs. 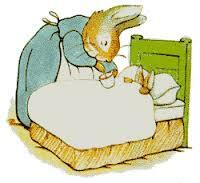 Peter Rabbit's mother put him to bed, and made some camomile tea; and she gave a dose of it to Peter! "One table-spoonful to be taken at bed-time." But Flopsy, Mopsy, and Cotton-tail had bread and milk and blackberries for supper.